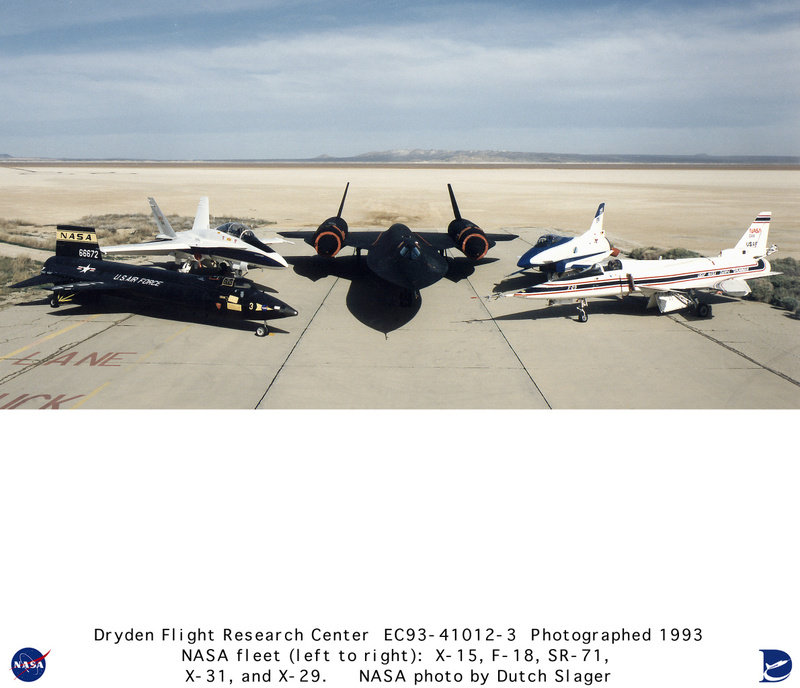 Description: A group photo of research aircraft at NASA's Ames/Dryden Flight Research Facility in 1993 (redesignated the Dryden Flight Research Center in 1994). Left to right: mock-up of X-15, F-18B, SR-71A, X-31, and X-29. The X-15 mock-up is painted as the #3 aircraft, which was lost on November 15, 1967, in an accident that resulted in the death of Air Force Major Mike Adams. The mock-up is now (2001) atop a pole in front of Dryden's main gate. The two-seat F-18B was in use around the turn of the 20th into the 21st century as a chase aircraft for a variety of projects. The SR-71 was one of several transferred to NASA after the aircraft was retired by the Air Force. The X-31 was designed to test flight at high angles of attack using thrust vectoring. The X-29 served as a testbed for forward swept wings. These aircraft and mock-up suggest the great variety of flight research that Dryden Flight Research Center and its predecessor organizations have conducted over more than 50 years since 1946. Keywords: SR-71; Dryden Flight Research Center; U.S. Air Force; sonic booms; Jet Propulsion Laboratory; LASRE; YF-12; Dave Lux; Steve Schmidt; Lockheed Skunk Works; Lockheed Martin; Pratt & Whitney; Dryden Fleet Aircraft; X-15; mock-up; F-18B; SR-71A; X-31; X-29.